nice pillows for price. use for decorative shams. Perfect for guess bedrooms or as a touch of extra comfort, this set of pillows is available in a range of densities for a soft night's sleep. The medium pillows are perfect for back or stomach sleepers, while side sleepers will love the firm or extra firm pillows. The pillow has a soft cotton shell filled with plush polyester fiber. these " pillows " are not for you ! The quality is good overall but does not stand up next to another brands extra firm. I have an extra firm pillow but the pillow I received is more along the lines of just your average pillow. Not knocking your product was just expecting a different firmness. Needed some extra pillows for a guest bedroom. 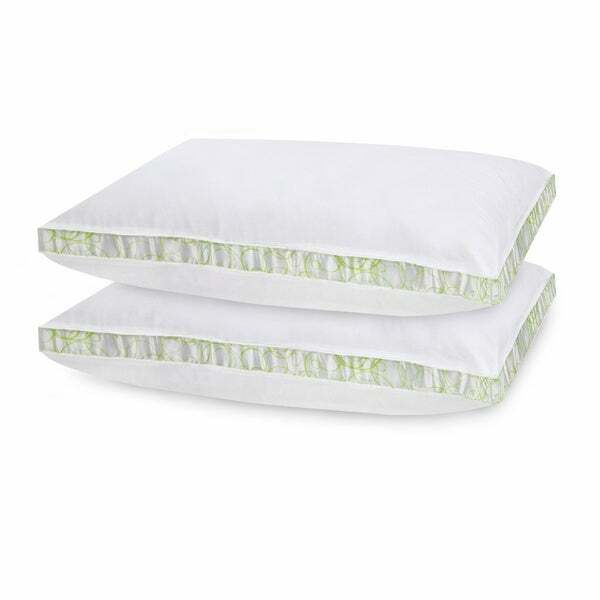 Not the best quality pillows as the fill will likely shift easily, but excellent value and perfect for what we needed. I could not tell from the description that these pillows came as a pair, so I ended up buying two sets, and now have four new pillows. They are good pillows and have good shape. However, I was looking for some firmer ones. They look good on the bed, and it turns out that my partner really likes them, so it is not a problem. I bought these to stuff two king shams I had just bought - my regular king pillows were not bulky enough and the shams looked droopy and were too soft. These are perfect - very firm and bulky enough to fill out the shams nicely. These might be too much for "sleeping pillows," but very happy with them as bed top sham stuffers! The pillows are a great price and are very comfortable. the medium firmness is perfect. These are good pillows. They are firm pillows. These are very beautiful pillows, great buy. I received them yesterday and they bounce right back, I ordered Firm and they're nice but should have got Extra Firm next order I will. Love them. Thanks overstock. I purchased these pillows to fill my sham pillow covers, and I really did not expect them to be as comfortable as they are, but now they have replaced my down pillows as my main pillows. I am a side sleeper, and they are sooooo comfortable and overstuffed. They give just enough to make side sleeping enjoyable! Excellent quality and fair price for these pillows. I purchased these to use with my shams. They don't fill out the shams, but I will keep them for the price. My husband uses the same pillow for sleeping and likes it. I like a extra firm pillow and these pillows were no where near that. I am returning them. Quality pillow for a reasonable price. These pillows work out great for what I was looking for. Haven't had the pillows long enough to see if they will maintain their firmness. But so far so good. I wish they were a little thicker, but it's hard to tell when ordering online. They are good. I sleep on my side and they are comfortable when sleeping on side. These pillows keep their shape well. I've had them awhile now and they are still plump and firm. I'm a side-sleeper and the density in these pillows helps in keeping my neck from hurting when I awake. Good purchase! These pillows do the job. I like the extra firm pillow to use as fillers for decorative shams. You can’t beat the price for a pack of 2. I recommend these! I bought these for guests, but my husband has coopted them for his own use. That's how nice they are. They are just the right density to provide neck support, not overstuffed, and filled well enough not to be batted down overnight. They also have lasted, and wash beautifully per instructions. Nice, wash well and hold up well. Very comfortable. Very good support for my head and shoulders. My son loves these pillows. Not to firm or soft. I love extra firm pillows. They help me with my back pain.